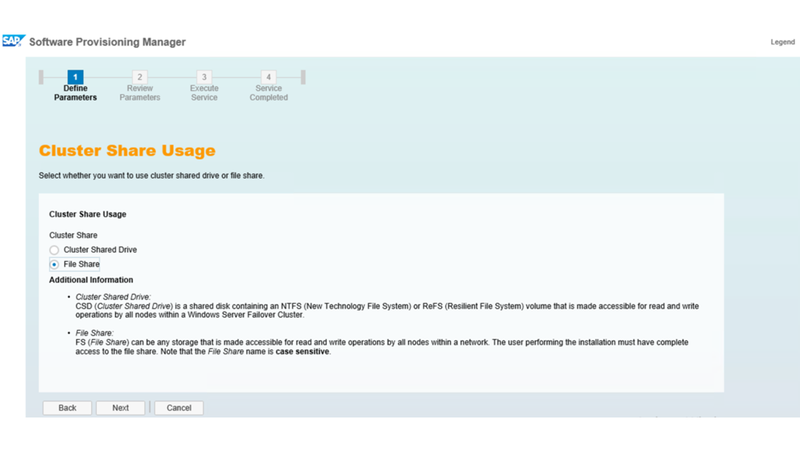 SAP introduced the concept of the File Share Cluster a while ago, along with instructions on how to manually configure or migrate to such a system. This new cluster configuration provides an alternative to the established cluster with shared disks. Instead of installing the (A)SCS on the shared disk of a cluster, it is installed locally on a drive of each cluster node and some central files are stored on an external file share. I am happy to announce that the option to install a clustered (A)SCS using a file share instead of shared disks is now available in the most recent Support Package 25 of SWPM for all databases that support the Windows Failover Cluster. This provides an automated and supported installation without intermediate manual interaction. All you have to do in advance is to prepare a file share and grant full control to the user that will run the installation. Then you perform the usual preparation steps of a High Availability installation, except, you don’t have to care about shared disks! After the short preparation, you start SWPM, select your desired database, and select High-Availability System. There you will find several different installation options which are presented in the recommended order. At first, you need to install the (A)SCS and ERS on the First Cluster Node. During this installation, you will find a new screen that asks if you want to perform the established Cluster Shared Drive (CSD) installation or our new File Share (FSC) installation. In the next dialog, you just need to enter the host name of your designated sapmnt file share and the rest of the installation follows the same procedure as usual. The neat thing is: the other installation steps either don’t change, depending on your choice of CSD or FSC, or your choice for the First Cluster Node installation is recognized automatically. However, you should take extra care about the installation of the Database Instance. In the CSD scenario where you have cluster shared disks, it makes sense to install the Database Instance also on a shared disk. In our File Share Cluster scenario, we want to avoid shared disks. Therefore, you should consider installing the Database Instance either on a different host (possibly also a cluster), or use database mirroring techniques that don’t require shared disks, for example, SQL Server Always On. 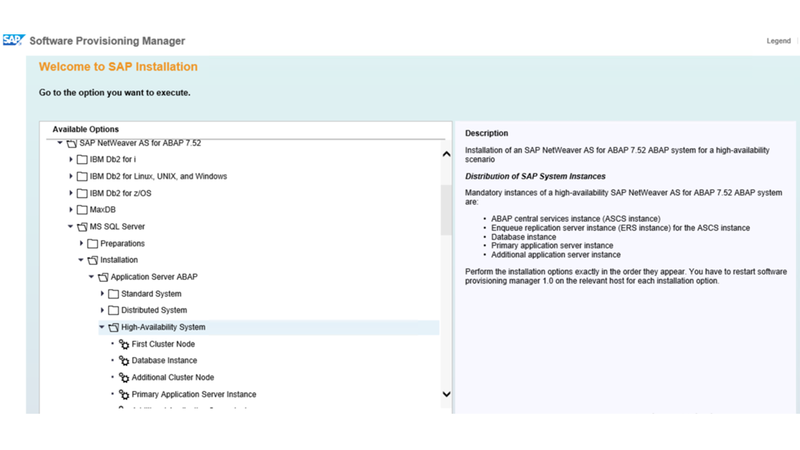 After the installation of the SAP system, you will notice that the (A)SCS is installed locally on each cluster node, but a few files are stored on the external file share. As you see, the SYS folder with the SAP executables and profiles, as well as some of the folders in the (A)SCS instance folder, are now located on the file share. For your convenience, these folders are created on the local drive of the cluster node as links to the respective locations on the file share (represented with orange arrows in the figure). So, you have the same folder structure as in a CSD installation. Now, you are set up to use your high available (A)SCS system. Please try this new feature in SWPM and be sure to also read the official documentation on the topic!